Pre-P.S. : In case you missed it from yesterday, Deborah from Taste and Tell was nice enough to spotlight me for her Blogger Spotlight series. I’ve been checking Deborah’s blog for years now and her practical, no-fuss approach to cooking and baking keep me hooked. Thanks, Deborah! I’m all about having a bit of chocolate sweetness to end the Thanksgiving meal. Enter this dessert. 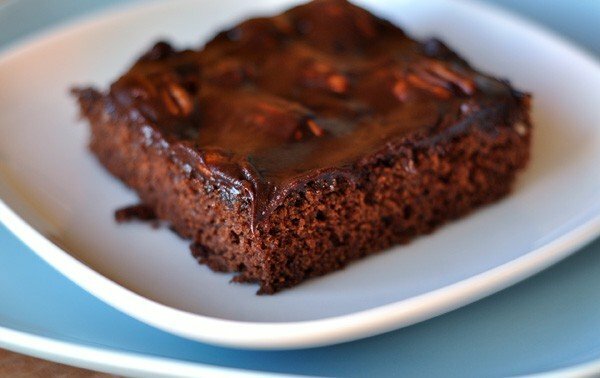 A moist, decadent cake is topped with toasted pecans and a caramelly, chocolate glaze. The entire combination is rich, indulgent and completely worth every bite. The great thing about adding this to your holiday table is that it can be made up to two days ahead of time. Preheat oven to 350 degrees. Butter and flour a 10 ½-inch by 15 ½-inch jelly roll pan. Tap out any excess flour. As you can see from the picture below, I don’t own a pan this size, however, by folding foil and using my mini-loaf pans, I adapted my large baking sheet to work just fine. Sift the flour through a fine-mesh strainer into a large bowl. Add the sugar, baking soda and salt. Stir well to combine. Set aside. In a medium saucepan over medium heat, combine the butter, milk, and cocoa powder. Bring to a boil, whisking frequently until the butter melts completely and the cocoa is incorporated. Add the hot chocolate/milk mixture to the flour mixture, whisking until combined. Add the eggs and vanilla and whisk until well blended. Pour the batter into the prepared pan. Bake until a toothpick comes out clean, about 18-20 minutes. Transfer to a wire rack and let the cake cool completely in the pan. For the glaze: In a medium saucepan over medium heat, combine the cream and corn syrup. Bring to a simmer then reduce the heat to low. Add the chocolate and whisk until melted and smooth, about 1 minute. Remove from the heat and let the mixture stand until lukewarm, about 10 minutes. The glaze should be thick but pourable. Makes about 1 1/3 cups. Arrange the toasted pecans evenly over the top of the cake. Spoon the glaze over the top, carefully spreading it in and around the pecans. This step is messy and it’s ok if the glaze isn’t completely smooth over the top of the cake. Let the frosted cake stand at room temperature until the glaze sets, about 3 hours. Cut into squares. 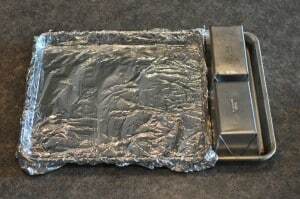 Serve, or cover with aluminum foil and store for up to 2 days at room temperature. This cake, once frosted with the glaze, needs to sit at room temperature for a couple of hours for the glaze to set so plan ahead! 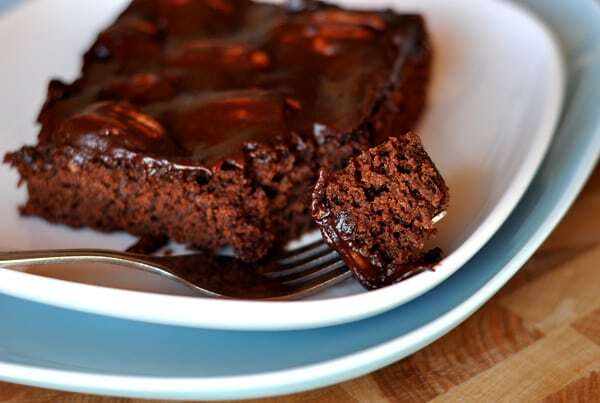 The original Mississippi Mud Cake was in (I believe) a Hershey’s cookbook 30+ years back. My mother made it and to this day it is a huge hit – the cake takes coconut and chopped nuts and it’s layered with marshmallow fluff and chocolate frosting. It’s not Mississippi Mud without the marshmallows! Oh geesh, thanks mel! not sure how I missed that! I doubt 3 eggs will ruin it…we’ll find out! Hi Sara – actually the eggs are there on the ingredient list, hidden between the cocoa powder and the vanilla. This particular recipe calls for 2 large eggs – hopefully that doesn’t mess you up to much! I enjoyed your interview and thanks goodness for chocolate. I told you your recipe list is OUT OF CONTROL! There are so many I want to try I don’t know where to start, I’m overwhelmed with My Kitchen Cafe goodness! That chocolate glaze looks so rich and decadent! Skip the pumpkin pie, I would be all-for a bite of this after Thanksgiving dinner! mmMMMmmmm!!! Mississippi Mud is so delicious. My mother-in-law introduced me to this cake. She puts a layer of marshmallow creme on hers right after it comes out of the oven and then puts the glaze on top. What a great spotlight! Deborah is a friend of mine, we use to work together back in the day. I too love her blog! If you haven’t tried this soup- http://www.tasteandtellblog.com/2009/01/chicken-and-cheese-enchilada-chowder.html – it is a must! Can I move in with you??? This looks good, and I’ll be making it this weekend. Yesterday we had your white chili, the best I’ve ever had. Earlier in the week we had the cheesy potatoes, and they were so yummmy. Your blog is the first one I check every morning. I’ve emailed you a couple of times to thank you for sharing, but I have to thank you one more time. I’ve printed most of your recipes, and I’ve made a binder that I use constantly to plan our meals. Today I’m making the pumpkin cream cheese muffins! I just wanted to say – I have always loved to cook but I have always loved to eat out, too. Since I have been reading your blog (almost a year now) I have not wanted to eat out except for that special occasion here and there. You really have given me a new appreciation for cooking home-cooked meals. Everything has been a winner and I tell my husband, “It’s from the cooking blog I really like”. I also love the way you describe each recipe! I look forward to seeing what you have in store each day! Thanks for taking the time!! Where’s the pic of the pan? Just curious how you used your mini-loaf pans and foil to make the size accurate. This looks so good, by the way. MMM. Joyce – thanks for the heads up. I forgot to add it in but it should be there now. Oh my….be still my chocolate craving! 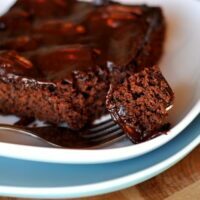 chocolate cake with a chocolate glaze sounds perfect! Now this is definitely my kind of cake.